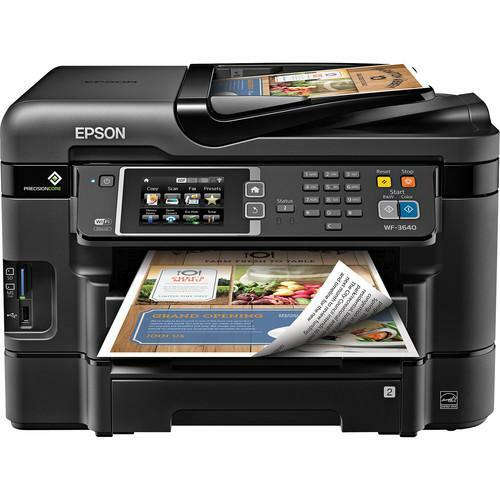 We recommend checking out our discussion threads on the Epson WorkForce WF-3640 Wireless Color All-in-One C11CD16201, which address similar problems with connecting and setting up Inkjet Printers Epson. The user manual for the Epson WorkForce WF-3640 Wireless Color All-in-One C11CD16201 provides necessary instructions for the proper use of the product Computers & Solutions - Printers & Accessories - Inkjet Printers. The Epson WF-3640 Wireless Color All-in-One Printer is a fast office printer capable of printing in monochrome at speeds up to 19 pages per minute in addition to the automatic duplex printing capability. This is possible due to the PrecisionCore Print Head that allows for print resolutions of 4,800 x 2,400 dpi and droplets as small as 2.8 pl. It also has functionality for scanning, faxing, and copying, making it useful in a work environment. Scanning can be done at an optical resolution of 1,200 x 2,400 dpi, meaning you will be able to get detailed scans from your documents and images. Also, additional features and settings for scanning, faxing, and copying are available on a 3.5" color LCD touchscreen on the front panel. This helps set the printer up as needed. Paper is handled in two ways, either through the 35-sheet automatic document feeder for certain jobs and paper types or the two 250-sheet front-loading trays that will hold most general purpose paper types. It can even handle sheets up to 8.5 x 14" in size for wide-format needs. This system is durable, being capable of handling 20,000 pages per month. Additionally, the WF-3640 features both Wi-Fi and Ethernet connectivity for multiple networking options. If you own a Epson inkjet printers and have a user manual in electronic form, you can upload it to this website using the link on the right side of the screen. Box Dimensions (LxWxH) 21.0 x 20.3 x 15.6"
The user manual for the Epson WorkForce WF-3640 Wireless Color All-in-One C11CD16201 can be downloaded in .pdf format if it did not come with your new inkjet printers, although the seller is required to supply one. It is also quite common that customers throw out the user manual with the box, or put the CD away somewhere and then can’t find it. That’s why we and other Epson users keep a unique electronic library for Epson inkjet printerss, where you can use our link to download the user manual for the Epson WorkForce WF-3640 Wireless Color All-in-One C11CD16201. The user manual lists all of the functions of the Epson WorkForce WF-3640 Wireless Color All-in-One C11CD16201, all the basic and advanced features and tells you how to use the inkjet printers. The manual also provides troubleshooting for common problems. Even greater detail is provided by the service manual, which is not typically shipped with the product, but which can often be downloaded from Epson service. If you want to help expand our database, you can upload a link to this website to download a user manual or service manual, ideally in .pdf format. These pages are created by you – users of the Epson WorkForce WF-3640 Wireless Color All-in-One C11CD16201. User manuals are also available on the Epson website under Computers & Solutions - Printers & Accessories - Inkjet Printers.